Hand-made ceramic copy of a Greek wine cup from the 9th Century BC. Three different designs painted on sides, including the Dionysus Priestesses dancing, checkerboard pattern, and traditional geometric shapes. 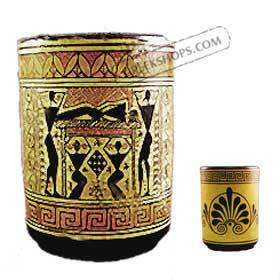 The wine cup depicts Dionysus Priestesses in a wine celebration. Dionysus was celebrated as the god of agriculture and entertainment for which he was often celebrated. Makes an impressive household decoration, or even an elegant pencil holder for your desk. This is a hand-painted reproduction, individually signed by the artist.